We’d love your help. Let us know what’s wrong with this preview of Tale of a Job Interview at OhlalaLand by Stephanie Batailler. A Job Seeker in Hollywood (OhlalaLand.) A Legendary Film Studio. A Tale within a Tale. A Parade of Wacky Characters. A Biofiction. A Job Fantasy. Tale of a Job Interview at OhlalaLand is a biofiction where the author and the protagonist share the same dream: getting a job in a legendary film studio. Once upon a time…“Baby born with teeth, starts talking to obstetrician and m A Job Seeker in Hollywood (OhlalaLand.) A Legendary Film Studio. A Tale within a Tale. A Parade of Wacky Characters. A Biofiction. A Job Fantasy. Once upon a time…“Baby born with teeth, starts talking to obstetrician and midwife about her gestation experience!” Indeed, Stephanie was born to create and tell stories like the ones that inspired her entire childhood, the stories from OhlalaLand Studios. Hoping the legendary studios will recognize her skill as a storyteller, Stephanie is one step closer today as she stands in front of the studios’ gate with a job interview summons in her hands. But the experience isn't quite what she expects. Indeed, OhlalaLand's interviewing process is a little…unusual, a little…OhlalaLandian! Tale of a Job Interview at OhlalaLand is a tale within a tale with a parade of wacky characters where talking animals, walking buttons, ghosts with cellular phones, and epicurean pen-people are as real as the mystical creature interviewing Stephanie. In the nest of wonder and imagination, happily ever after is never really far away…or is it? Could it be a new literary subgenre: the Job Fantasy? Have you ever had enough of emailing your résumé without ever receiving any response? If so, Stephanie’s story is YOUR story. This was, indeed, the original idea behind the book: trading a résumé for a book and send it to human resources and film studio executives. But things have slighting changed directions now and the author has decided to go on writing fantastic tales and publishing them in a book series, the OhlalaLand stories’ series. 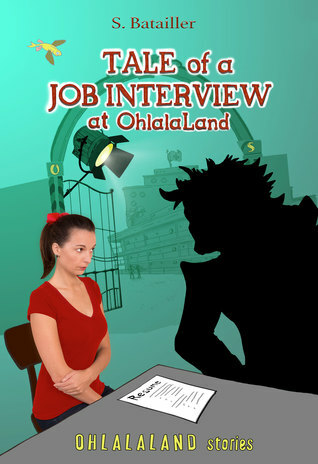 To ask other readers questions about Tale of a Job Interview at OhlalaLand, please sign up. A must-read for any job-seeker, person bored at work, or anyone who wants to smile. Tale of a Job Interview at Ohlalaland is the creative short story I've been thirsting for as someone who loves to read but has so little time. Imagine a job interview on Mr. Toad's wild ride down the rabbit hole through the land of Oz with fantastical creatures of wonderland narrated like the cult film classic A Christmas Story. The woes of job hunting and interviewing are something we can all relate to and it's ref A must-read for any job-seeker, person bored at work, or anyone who wants to smile. The woes of job hunting and interviewing are something we can all relate to and it's refreshing to see this fanciful look at it amid the stockpiles of advice from LinkedIn, recruiters, friends, etc., that seemingly lead to nowhere. Human Resources are anything but humane in this upside-down world, a comical looking glass on modern society. The characters in this tale are very imaginative, the illustrations hilarious, making the reader want more, wishing it were a film. The language is upbeat and accessible, and the story is sprinkled with fun movie trivia. I am so glad that Stephanie decided to pursue writing in English! Stephanie takes us to fantasy backstory in France with witty humor and great imaginary. A young child that is inspired by the gift of reading which leads her to view the world unconventionally but like for most creative souls society and family tend to misunderstand children that color outside the lines, I think sometimes it's just soul-crushing. The book is very personal, creative and captivating. It exposes the real struggles that many of us face in our job searches and career explorations. Those struggles in her story then pivot into a very creative direction with the characters that Stephanie brings to life in a very passionate way! The book ends with a twist and leaves you with deep anticipation as to how the story will continue to unfold in Stephanie's next book - which I can't wait to read. Born and raised in France, Stephanie Batailler spent her childhood between the French Alps and the South of France –which fed her overactive imagination with great settings and inspired her to start writing fantastic tales. At 23, she graduated with a Master’s degree in History from the Sorbonne University in Paris and moved to New York where she studied Film Production. In 2003, she received the New School University Award for Excellence in Experimental Film. After school, she worked independently in the Big Apple as a producer, director, and camera operator. In November 2011, Stephanie packed her bags one more time and left New York for the sunny West Coast. She first started to teach ESL in a private language school in Hollywood. Teaching English to immigrants is something that Stephanie particularly enjoys doing. She likes to pass on her experience –as a few years ago, she herself was an ESL student. Stephanie is now pursuing a career in writing and story development in the entertainment industry in Los Angeles, California. When not writing books, scripts, or lyrics, you can find her recording songs as Skyebat, cooking, playing badminton, or hiking in Griffith Park. OhlalaLand stories’ books are available in English, French and soon in Chinese.